Chanel Aqualumiere Gloss Friandise is a limited edition Aqualumiere gloss released as part of the Les Delices de Chanel makeup collection. Chanel discontinued most of the Aqualumiere glosses a while back - at least here in the US - but they do release one or two shades once in a while as part of a smaller makeup collection. Aqualumiere glosses are thicker than the regular Levres Scintillantes Glossimer, and most of them come loaded with tons of shimmer. The consistency is quite thick, and these pack a little more pigmentation than most regular Chanel glosses. Friandise has a peachy pink base with tons of pink-iridescent shimmer in it. The color looks more pink than peach/coral because of this shimmer, and it adds a lovely shine to the gloss. Scroll on for photos, swatches, and more. Brush applicator instead of the doefoot applicators seen in Chanel glossimers. The shimmer in Friandise adds a lovely pinkish sheen to the gloss, and depending on the light, it actually makes this look more pink than a coral gloss. I generally hate shimmer in glosses, but as always, Chanel does shimmer beautifully. It is seen on the lips (not in my photo, though) just as well as it does in the swatches yet stays quite subtle. There is some sheerness to the formula - it is a gloss - and the underlying lip color does change how this gloss looks on the lips. Friandise is reasonably pigmented, though, and it shows up easily on my lips even if I don't use a lipliner. On my eyes: UD Perversion smudged along lashline/tightline with Smashbox PhotoFinish lid primer applied over it. Overall, I am quite happy with this gloss. Friandise looks a bright coral-pink in the tube, and on lighter/paler/clearer lips, this would show up as a lovley shimmery coral tint. On my lips, it looks more pink because of the underlying darker pigmentation and is an almost MLBB sort of color. The formula feels fabulous on the lips, and I get about 2 hours of wear time with this gloss. 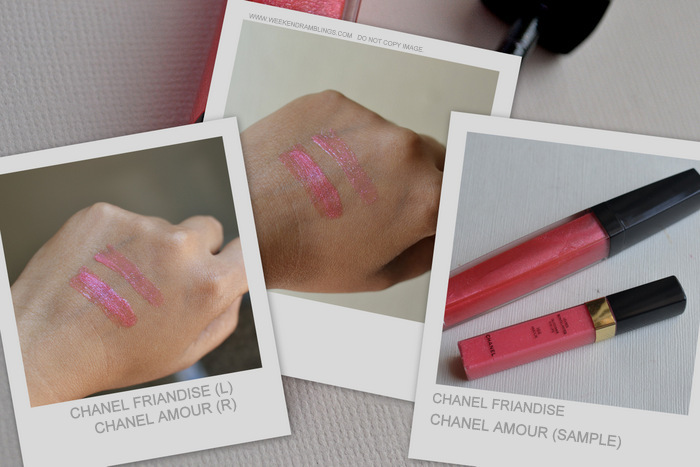 The only color that I have similar to Friandise is Chanel Levres Scintillantes Glossimer Amour. Amour has a lighter coral base and has similar pinkish shimmer, but it's goes on clearer than Friandise. On my lips, Friandise would show up better because it's slightly thicker. good review and really a lovely shade! Wow... that's such a pretty shade, so damn pretty. Looks quite natural on you.